Roses are Red, Violets are BLOOOO! Roses are red, violets are BLOOOOOO! While many traditional sporting champions are showered in red roses after victory, the Bluecoats from Canton, OH were showered by 22,000 people last night at Lucas Oil Stadium in Indianapolis all cheering "Bloo". It was a moment the Bluecoats drum and bugle corps has been waiting for since their founding in 1972 and first competition in 1974. Never before had this 150 member corps stood atop the DCI world. Since 1987 the Bluecoats have finished in the "Top 12" at the DCI World Champions and came as close as second in 2014 behind the Blue Devils who once again looked to play spoiler to the Bluecoats season. Coming into the final night of competition of the 2016 season the Blue Devils trailed the Bluecoats by only 0.275 points. Carolina Crown trailed by only 0.338 points, making finals one of the closest in history. The Blue Devils have won the World Championships six times in the last 10 years. The Bluecoats were not to be denied this year and took home the Founder's Trophy becoming only the 10th corps in the last 44 years to be crowned champion. They finished 0.400 points ahead of the Blue Devils. 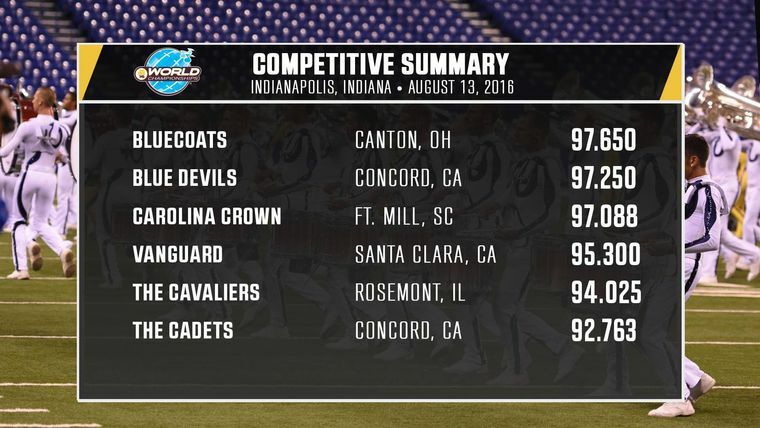 Carolina Crown finished in third. "It's an incredible feeling," said David Glasgow, Executive Director of the Bluecoats. "One thing that not a lot of people know about the Bluecoats is that we actually folded twice in our history. To experience that and then be here tonight is surreal." 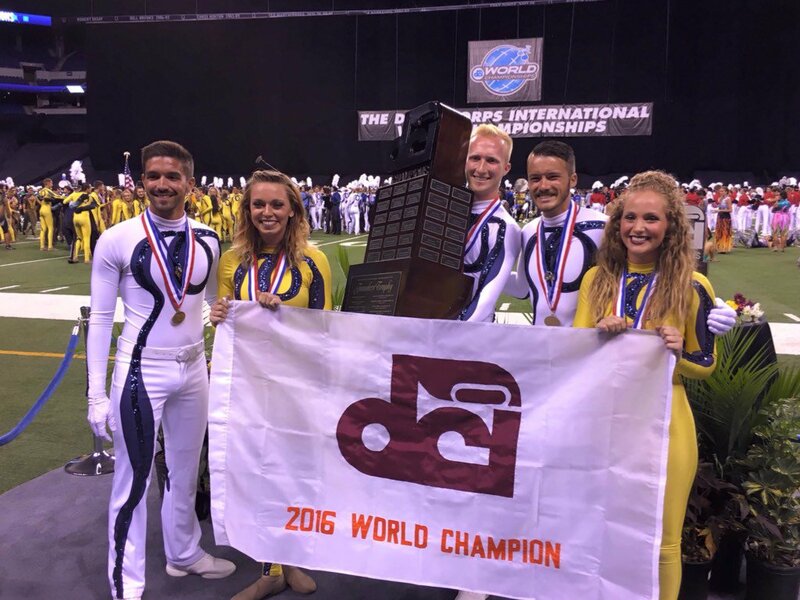 Congratulations to the @Bluecoats on winning their first @DCI World Championship! The Bluecoats have been pushing the limits of DCI over the past few years and their "Tilt" show in 2014 is still regarded as one of the most innovative ever performed. This season the Bluecoats took their show in a new direction, "down side up". They experimented with half pipes that altered the marching perspective. They blew away fans with their brass line and powerful arrangements. Yet, this show might be remembered for something much more subtle, a wink. A Bluecoats trumpet soloist took the DCI world by storm over the past three days as he winked into the camera during the live broadcast melting the hearts of fans across the country. He continued to do it each night of the World Championships and #TheWink soared in popularity. All winks aside, the 2016 DCI season belonged to the Bluecoats. They led the field nearly all summer making their march to the top that much sweeter. Traveling 10,000 miles to perform over 30 times while sleeping on buses and hard gymnasium floors in-between 14 hour days of rehearsal in the summer heat, can only be described in one word, grueling. All of that culminated in one 11 minute performance Saturday night that the 150 member Bluecoats will never forget. A performance that awarded them the title of World Champions.